WHEN: Wednesday 14th 11:00am - 11:00pm. 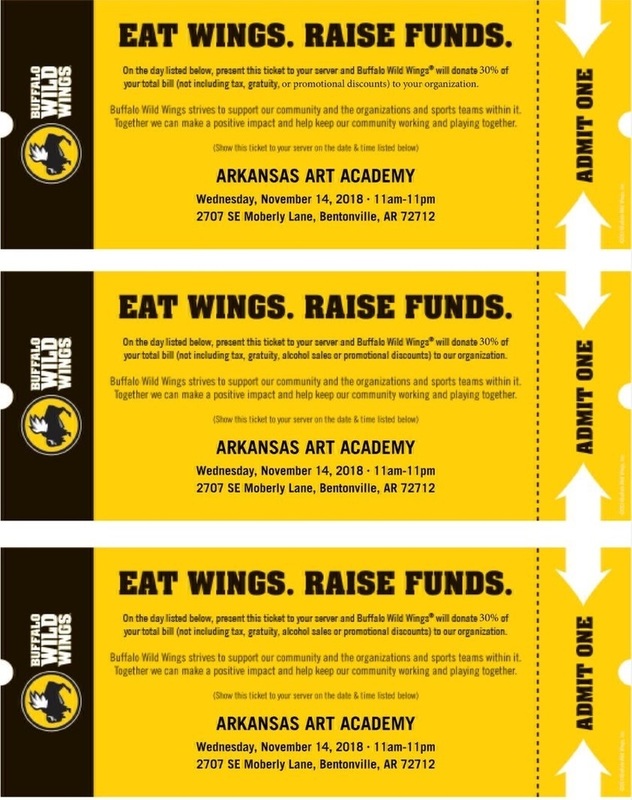 WHY: Buffalo Wild Wings will donate 30% of all sales to our school. HOW: Bring your ticket and give it to your server. If you forget your ticket, just show a ticket that will be on our App, Facebook pages: Arkansas Art Academy & AAA PTA-K6 Campus, Instagram: aaapta_k6, or if all else fails take a picture of it and you will have it on your phone. If you don’t have an actual ticket make sure to write Arkansas Arts Academy on your receipt. They will give 30% of all sales from ANYONE who shows the ticket so let all your friends and family know. Make copies or forward a copy of the ticket. Thank you for your support!